Thanks for all comments on my blog giveaway. It is so nice to "meet" everyone! Please continue to comment on my one year blogging anniversary giveaway post. It will end Monday evening. I am taking a little time off over this holiday weekend, but I want to direct your attention to Angela's excellent Tea with Friends Blog. Angela is conducting tea tastings and posting them on Saturdays. She is using Harney & Sons Teas and Michael Harney's excellent book, The Harney & Sons Guide to Tea. I'm glad to have found your tea blog! Thanks so much for the vote of confidence, Linda! That means a lot! Delights of the Heart has tagged you today. Visit and see what it is all about. Very tasty tea blog. Thank you for sharing! 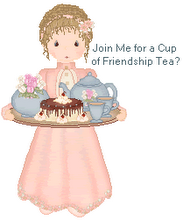 Am looking forward to more tea with friends. We're most definitely a big tea family! Nice and strong, and blended (two with milk, one plain).